These trays with a barnwood finish are as functional as they are beautiful great to use just as they are, or add paint, stencils, decoupage, etc. for a personal touch made from paulownia wood with 4mm sides and plywood bottom. 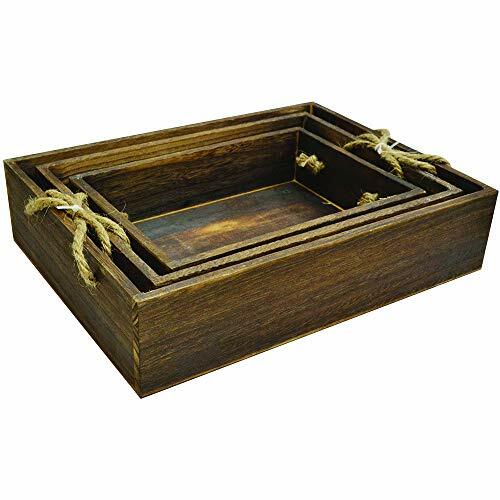 Trays are sold as a nested set of three with jute handles on each side. Large tray - 12. 5"x9. 5"x3" medium tray - 11"x8. 25"x2. 625" small tray - 9. 5"x6. 75"x2. 25"
If you have any questions about this product by Lara's Crafts, contact us by completing and submitting the form below. If you are looking for a specif part number, please include it with your message.